During the Vietnam War, thousands of sailors who served offshore in the “Blue Water” Navy were exposed to Agent Orange—a deadly toxin used to defoliate the forests in Vietnam. Despite the Agent Orange Act of 1991—which established a “presumptive connection” between some diseases and exposure to Agent Orange and made it easier for vets to qualify for benefits—the U.S. Department of Veterans Affairs (VA) denied compensation to Blue Water Navy vets for medical conditions related to Agent Orange. Since they hadn't actually stepped foot in Vietnam or had "boots on the ground" or served on boats in inland rivers, the VA initially determined that "mere service on a deepwater naval vessel in waters of the Republic of Vietnam is not qualifying service in Vietnam. However, these sailors worked on ships that pumped in water that was likely contaminated and used for laundry and showering, and may have been distilled for drinking. Additionally, some of the deepwater vessels did enter the inland waterways, and others docked in Vietnam. Sailors who served aboard these ships may have been exposed to Agent Orange through air exposure from "spray drift," and soil and food contamination. In 2008, the VA began to recognize that sailors whose ships docked in Vietnam or sailed in inland waters were eligible for the “presumption of service-connection” for Agent Orange-linked medical conditions. And in early 2019, a federal court ruling gave presumptive disability status to over 90,000 Blue Water Navy veterans. The change occurred after a Vietnam veteran suffering from cancer sued the VA, arguing it should recognize the connection between his medical condition and Agent Orange. 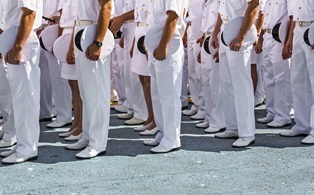 The court agreed in a 9–to–2 decision and ruled that the 1991 Act never intended to exclude those who served on the water. Even if you don’t qualify under the listed ships or designations, you should check the complete list of ships that came in contact with Agent Orange. It’s important to note that if you’re a Blue Water Navy vet filing for VA disability due to an Agent Orange-associated disease, you’ll need to prove you were aboard one of the listed ships that docked or landed crewmembers in Vietnam; or you were on a boat that entered Vietnam’s inland waterways. Currently, hypertension, hypothyroidism, and bladder cancer are being considered for this list. If you're a Blue Water Navy vet and believe your medical condition is linked to Agent Orange exposure, contact Cuddigan Law. You’re now eligible for VA benefits, and we can help prove your disease qualifies for compensation. The experienced attorneys at our firm can help with your VA disability application, if necessary, so contact us right away for a free assessment from an intake specialist.